Did New York City Planning Officials Sidestep Looking at the Bigger Atlantic Yards Picture? 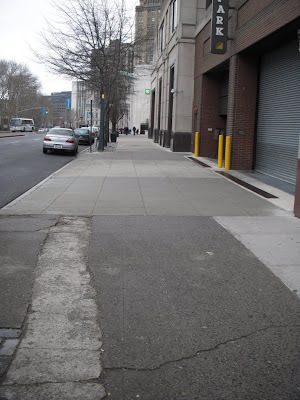 That, together with other nearby Forest City Ratner sites like MetroTech, would give the politically-favored, publicly-subsidized real estate firm a mega-monopoly on a total of about 50 acres constituting a heavy preponderance of the most primes, densely zoned land in or near Downtown Brooklyn, property that is particularly valuable because it sits astride the key subway lines that make Brooklyn’s best land readily accessible. Did City Planning Look at the Whole 19-Yards Towers Version of the Megadevelopment? Essentially the project wound up being the same size (or slightly bigger) than it was originally proposed when introduced December 2003 as follows. Like a department or electronics store “rasing prices” so they can then advertise “lowering prices” as a phony sales pitch, the developer, Forest City Ratner, boosted the theoretical size of the mega-project in order to thereafter advertise on the front page of the Times that it had been `reduced’ (For a lot more on this see: Tuesday, December 26, 2006, The Times defends the front-page scaleback story, but then practices "rowback") Ergo, the project was not actually made smaller than the giant sponge for subsidy that the developer himself originally conceived. Given all this focus on whether the mega-project was too large, combined with the fact that Ms. Burden and her city planning officials took credit for downsizing it when they actually didn’t, we wondered whether City Planning’s review of the mega-project looked at it in terms of its inescapably larger proposed size, 19 new towers rather than 16. We think they should have. Instead, the evidence is that City Planning again played along with the effort to depict Forest City Ratner’s overall plans as being for just 16 new towers. 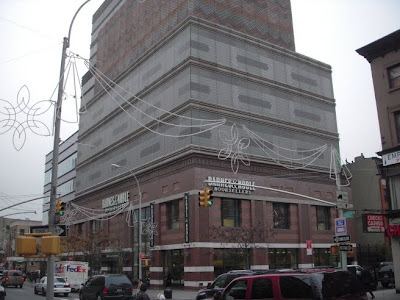 Exhibit A for this conclusion is the City Planning Commission’s September 27, 2006 letter of recommendations on the project ("Commission Letter") which only deals with 16 new towers and contains no mention of the three towers Ratner plans to build atop the Atlantic Center Mall. (That letter appears below.) 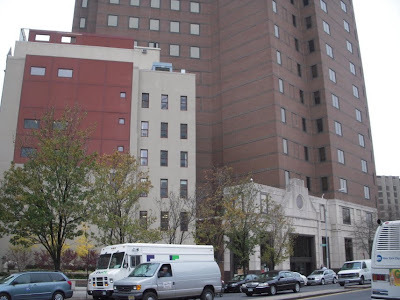 Not content to reach this conclusion without checking further we contacted City Planning to ask whether the Department or the Commissioner had considered plans for those three towers as part of the overall plans for the key Brooklyn site. We will let you review their response to decide for yourself, but again we think that the evidence is that neither the Commission nor the Department reviewed the developer’s overall plans and that their efforts were to downplay and view the project as a smaller project to the greatest extent possible. As you will discern from the commission’s letter, the commission writes about 16 new towers and it concerned itself with design questions pertaining to some of them. It doesn’t mention or similarly deal with the other three towers. 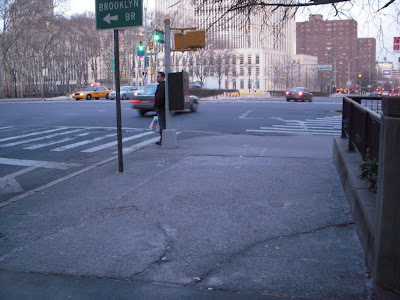 For all the letter may say, because of the Empire State Development Corporation’s override of city zoning as well as the normally applicable ULURP planning and review procedures, the City Planning Commission’s letter officially could only be persuasive; City Planning had “no veto.” (That may not be true with respect to the additional three towers in question.) Nevertheless, the letter and kabuki theater that accompanied it can be viewed as supportive of the project. Noticing New York’s Questions to City Planning: Did the Commission or the Department Review or Consider the Three Towers Atop the Atlantic Center Mall That the Developer Is Including In His Plans to Build 19 New Towers? I would like to know whether, when, and to what extent the Department and the Commission reviewed and considered the planned development of Forest City Ratner's three new towers over the Atlantic Center Mall. "The Commission is pleased that the ESDC and the developers have consulted with the Department of City Planning during the course of the design of this Project, and that this has resulted in several major improvements to the Project's urban design features and amenities." The Commission Letter indicates that the Atlantic Yards project that the Commission reviewed entails 7.53 to 7.555 million square feet of new development (EITHER 6,790,000 square feet residential, approximately 600,000 square feet office space and a 165,000 square-foot, 180-room hotel- OR- 5,730,000 square feet residential and 1.8 million square feet of office space). While the Atlantic Yards project is frequently described as a project of no more than 7.799 million square zoning feet (16 new towers plus a sports arena on 22 acres of land), the project has been considered as part of the developer's overall planned new development of 9.049 million square feet of contiguous commonly owned land (19 new towers plus a sports arena on approximately 30 acres of land). 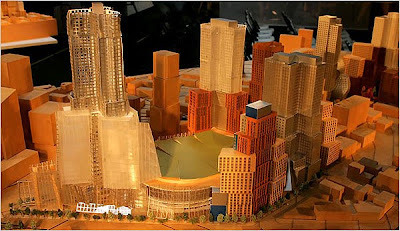 Original models of the overall development showed this larger configuration of 19 new towers plus the new arena. 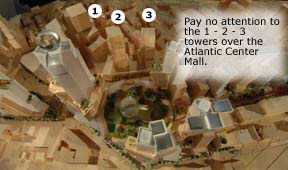 The difference between the more typically used description of the developer's planned new development and the larger configuration of new development is accounted for by three towers that will constitute 1.25 million square feet of residential and/or commercial development over the Atlantic Center Mall. 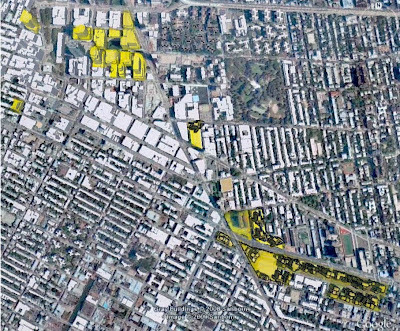 Presuming that space would be residential, that would be approximately 21.8% more residential space than the "5,730,000 square feet residential" considered by the Commission as part of what the Commission Letter referred to as the "Commercial Variation" of the project. You asked whether the three towers were addressed by documents signed by the city or the General Project Plan ("GPP"). 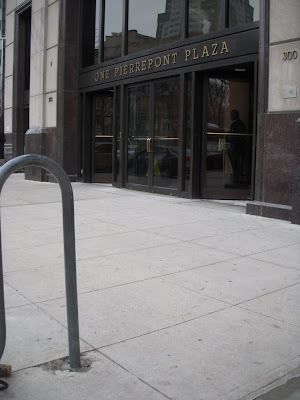 While the three towers may not, per se, be mentioned in the GPP the GPP integrates with the development of those towers and as they are addressed by the MOU (dated February 18, 2005) signed on behalf of the city by Deputy Mayor Daniel Doctoroff concurrently with other documents intended to address the project. It was also signed by the city's EDC. While the Commission Letter addresses itself to a number of aspects of development by the developer at the site, changes in design and reduction in size included, under various headings ("Building 1," "Building 3," "Building 6," "Site 5," "Open Space" and "Affordable Housing") the Commission Letter does not mention or address the developer's planned new development of the 1.25 million square feet of space in the three new towers over the Atlantic Center Mall. Here is the clarifying follow-up I request from you. 1. Did the Department review and consider the developer's planned new development of the 1.25 million square feet of space in the three new towers over the Atlantic Center Mall? 2. Did the Commission do so? 3. If so, when and to what extent did each do so? 4. Were recommendations made with respect thereto? 5. If so, what were these recommendations? 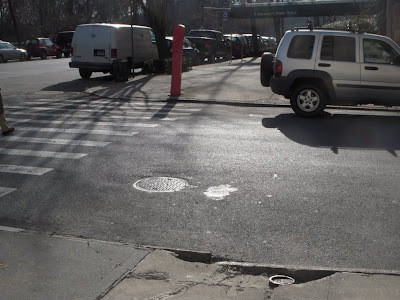 In response to your questions, the scope of the City Planning Commission’s review and recommendations regarding the Atlantic Yards Project are reflected in the GPP letter, available at the link you noted in your email. As to its consideration of the context of the project, that letter notes (pg 2) “The Commission believes that the [Atlantic Yards] Project builds on the City’s ongoing efforts to continue the growth of Downtown Brooklyn, the city’s third-largest central business district, by utilizing the area’s excellent transit infrastructure to provide new entertainment, commercial and residential uses.” The Department was well aware of the further Atlantic Center development potential inasmuch as this is a longstanding City project that has gone through the City’s land use review process. For additional information regarding the MOU you reference, your questions should be addressed to the signatories. Obviously that response says that “The Department was well aware of the further Atlantic Center development potential inasmuch as this is a longstanding City project that has gone through the City’s land use review process.” It says they are “aware” of the potential, but where is the evidence that City Planning dealt with it in any review? 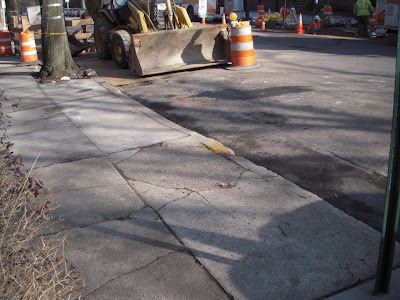 Why is it important whether the City Planning Commission or the City Planning Department dealt with the larger project as a whole rather than just participating in the manipulation of public perceptions about the project size? Because that is what city planning is supposedly about, looking at how planned city developments operate as a whole, integrating with the environment around them. The focus of City Planning officials is not supposed to be minimizing reviews and coordinating with the developers’ PR. 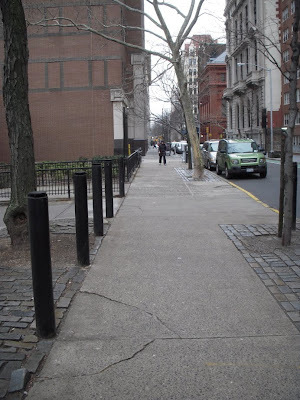 Forest City Ratner’s Two Buildings In Brooklyn Heights Need to be Condemned! 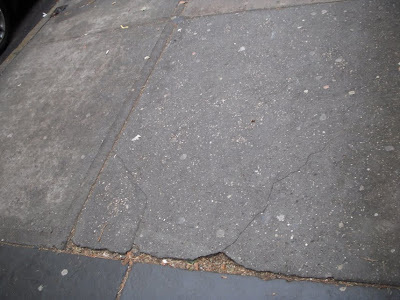 how ubiquitous “blight”-qualifying cracks in the sidewalk can be, how they can be found surrounding Brooklyn’s Borough Hall, anywhere in Manhattan that you might glance down, and in prestigious Brooklyn Heights, running the entire route from the premier homes on the Promenade to Borough Hall, no matter the street you pick to travel, Montague Street, Remsen Street, or whatever. 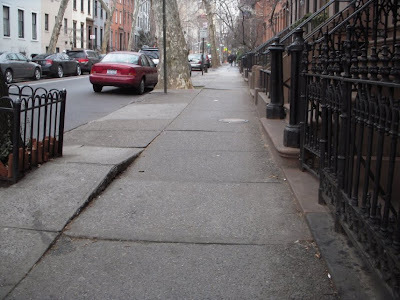 Look Sharp, Brooklyn Heights. Pay Attention, Mr. Ratner. 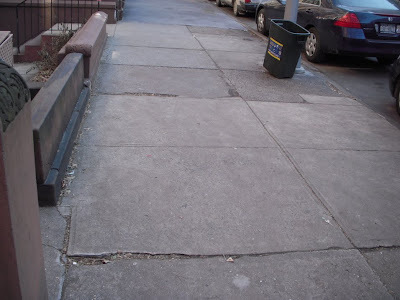 Brooklyn Heights residents better start getting ready for a lot of demolition and zoning increases because we are ready to write about the “blighted” condition of the Heights one more time: This time we are going to write about how the blocks with the two Brooklyn Heights Forest City Ratner-owned properties need to be condemned- - Lots of sidewalk cracks there too! . . .
. . . Surprise! 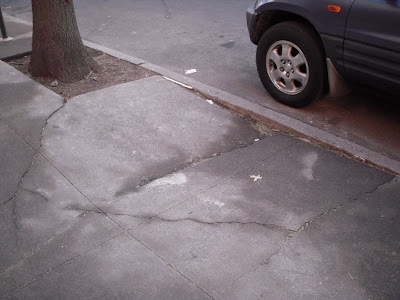 Forest City Ratner, the politically-connected developer that is utilizing the sidewalk crack “blight” pretext, as a eminent domain-invoking device to consolidate a mega-monopoly hold on 30 contiguous acres of prime Brooklyn real estate can be hoisted on its own petard. 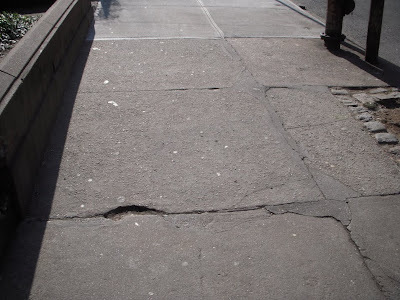 As soon as Forest City Ratner completes the proposed Atlantic Yards megadevelopment (if it ever does, and even then it may be forty years), the project can be seized from it because of sidewalk crack blight! (Maybe seized even sooner!) 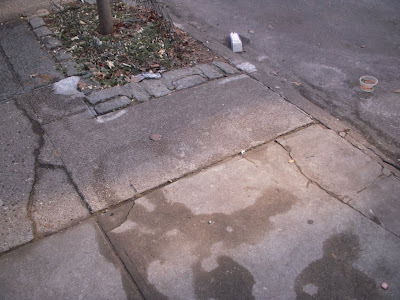 At least that’s the evidence in Brooklyn Heights. This shouldn’t to be a surprise. 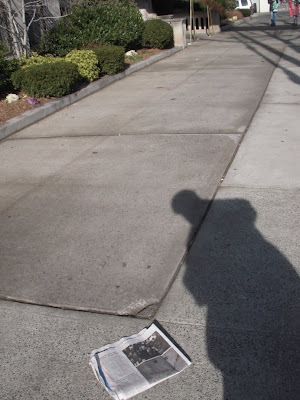 We recently mentioned in an article a point made by Connecticut eminent domain-abuse victim Carl Yacobacci that “eminent domain is a never-ending cycle of perpetual exposure to abuse.” (See: Tuesday, January 19, 2010, U.S. Supreme Court to Get a Doubleheader on NYS Eminent Domain Abuse? Pretext and Lack of Due Process PLUS No “Just Compensation”.) In that case he was making the point with respect the perpetual possibility of increasing density as a reason property can be taken, but the concern about “a never-ending cycle of perpetual exposure to abuse” applies to the wielding of any and all flimsy excuses. 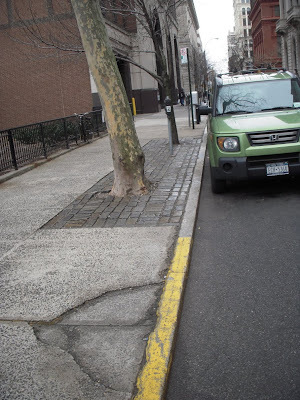 Let us show you the photos documenting the sidewalk cracks by virtue of which Forest City Ratner’s Brooklyn Heights buildings and the entire blocks they are on should all be condemned. 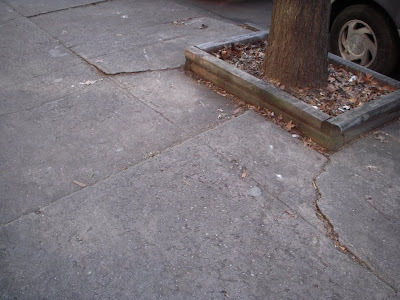 First, below for visual reference, is the relevant standard for objectionable blight-establishing sidewalk cracks. 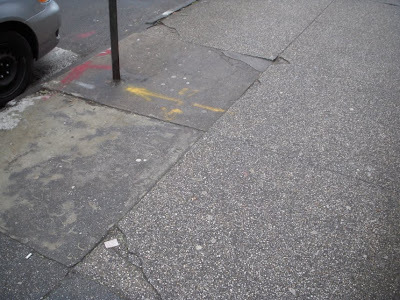 Photos documenting the sidewalk cracks are from the "professional" blight-finding study prepared for Atlantic Yards by AKRF. 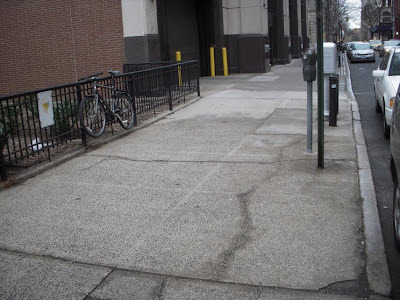 We start with the Forest City Ratner building that has sides (and sidewalk) along Clinton Street, Pierrepont Street and Cadman Plaza West. 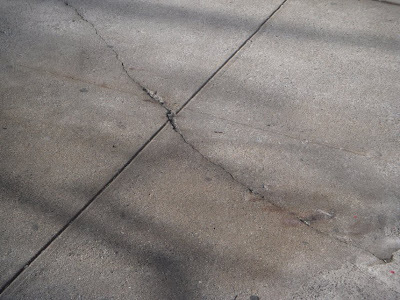 To be fair, while there are cracks in the sidewalk in front of that building, those cracks are not the worst that can be found near the building or on the block as a whole. 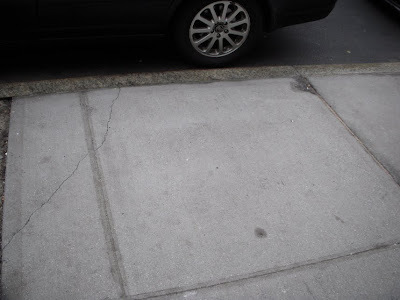 (There are also sidewalk cracks across the street.) 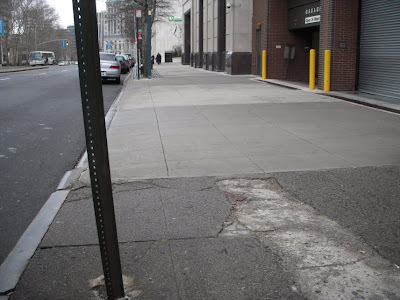 In addition, we must note that some of the most atrocious looking sidewalks outside the Ratner building look atrocious not because of the way that they are cracked but because of the way that they were repaired. Not fair to Ratner? When was Ratner ever fair to anyone else in this process? 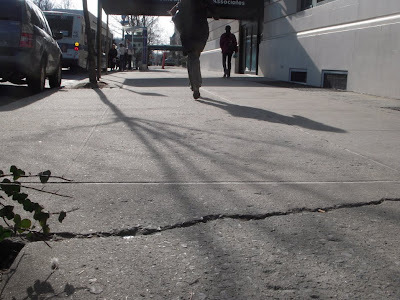 Furthermore, it doesn’t matter how bad the cracks are outside the Ratner buildings in particular are: Proceeding in the same way that our public agencies abuse these assessments. 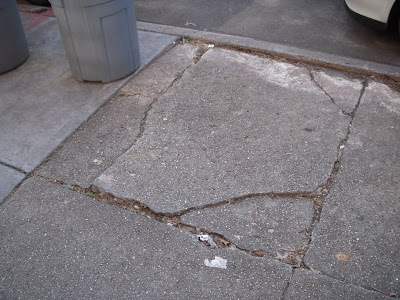 All that is required is to find cracks somewhere on the block and the whole block can be seized by eminent domain. 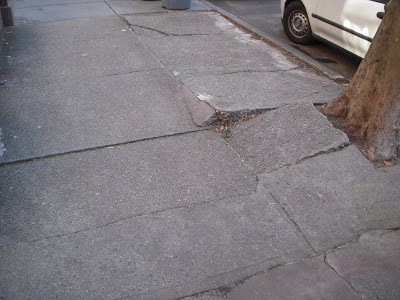 As far as repaired sidewalks go, although repaired sidewalks don’t count as blight, the blight assessments our government agencies commission by contract simply assume that sidewalks can’t be repaired and that it is therefore more cost efficient to tear down the neighborhood to eliminate blight. 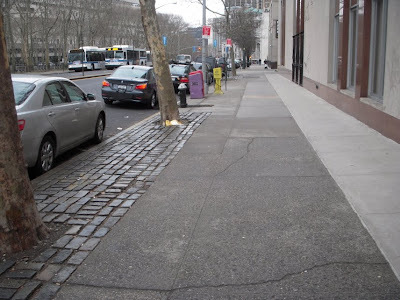 The other reason that there might not have been as many cracks outside of the Ratner building is that in one area an expanse of new sidewalk was just recently put in. 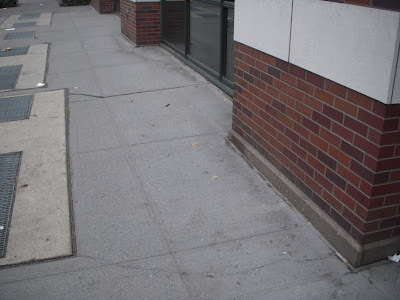 The building is relatively new (circa 1985) so the sidewalk must have deteriorated fast. 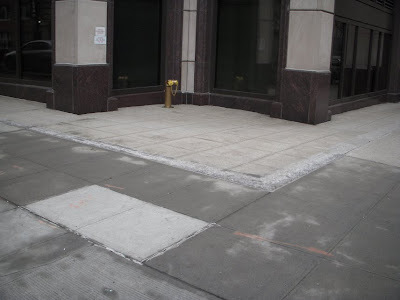 We just didn’t get there in time to take photos before its recent replacement. This building is another new (even newer, circa 2000) building. 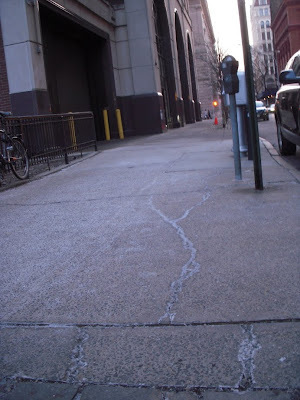 Again, were we to be fair in this process which is not meant to be fair, we would acknowledge that though the Ratner building has sidewalk cracks, there are worse cracks elsewhere on the block. 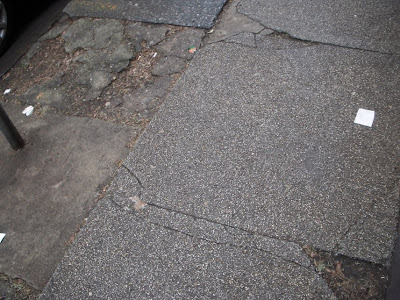 No matter, either set of cracks could provide an eminent domain abuse-minded government agency to seize and demolish the full block. Given that we are writing today about how well Forest City Ratner takes care of its property we cannot help commenting on what happened only yesterday: Due to flying construction debris Forest City Ratner caused a shutdown a 15-block area of the city, including– and this is quite thematically fitting– all of City Hall (see the map below from the Tribecca Trib). Shutting down City Hall seems thematically fitting because when agencies like ESDC jump on the Bruce Ratner bandwagon to do his bidding, no-questions-asked, it often seems as if nobody is home in this city’s government offices. 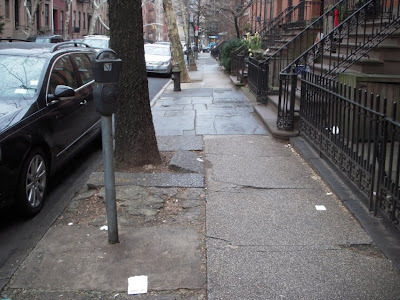 The building, on Spruce Street, received nine other violations over the past six months for failing to keep the construction area free of debris, and other housekeeping issues. 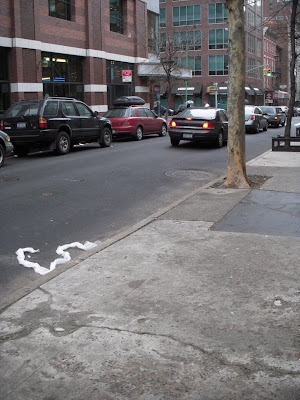 And speaking of how much of the city Forest City Ratner should be able to take over or shut down. . . 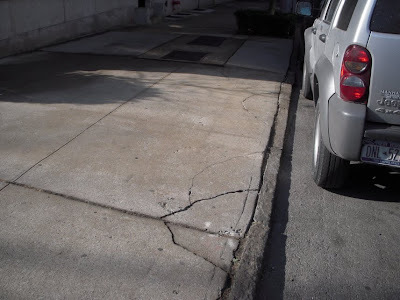 Eminent domain can be used for a reason entirely different reason from sidewalk cracks. One of the most precedent-setting and conceptually challenging cases in which the U.S. Supreme Court dealt with eminent domain was Hawaii Housing Authority v. Midkiff, 467 U.S. 229 (1984) which held that Hawaii could use eminent domain to break up and redistribute to a wider population land that was overwhelmingly concentrated in the hands of a few private landowners. 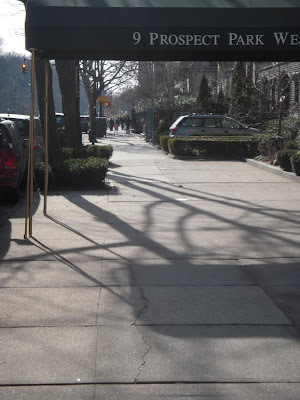 We suggest, not entirely in jest, that a diminishment of Ratner’s mega-monopoly on prime Brooklyn Real estate is reason enough to use eminent domain to take Forest City Ratner’s properties away. 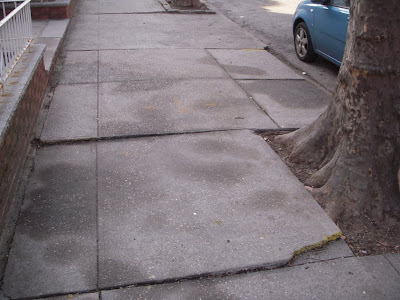 We suggest this notwithstanding that the reason that government agencies are seizing properties from their owners in very desirable Brooklyn neighborhoods is almost certainly not really because there are sidewalk cracks, but because those public officials desire to accommodate the politically-favored Ratner in his quest to extend the range of his government-assisted mega-monopoly ever further. NNY: I really don’t understand why people are NOT routinely thinking of Atlantic Yards as including all 19 new proposed towers rather than just the 16 new towers (plus arena) people most frequently confine themselves to talking about. 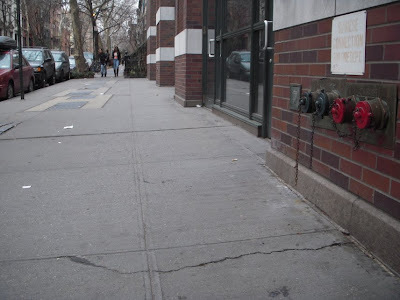 After all, when two Memorandums of Understanding (MOUs) were executed with respect to Atlantic Yards, (the last two), they were executed simultaneously and one of those two (the one that was kept secret) links the development of the three towers proposed to go over the Atlantic Center with the rest of the development, in particular, with the ULURP override and it also mentions SEQRA (State Environmental Quality Review Act) review. GF: But why should the three towers be considered to be part of the overall project if those three towers are just air rights? NNY: The three towers were presented as part of the physical modeling of the project more than once, the last time being May 11, 2006. That press conference for Atlantic Yards was actually at Atlantic Center. GF: The secret MOU mentions how SEQRA is going to be done but when SEQRA was done it didn’t include the three additional towers. NNY: That could actually be part of the problem. The courts are pretty strict about how SEQRA reviews are not supposed to “segmented.” Projects are supposed to proceed all together as a whole rather than be tactically divided up into portions to make it seem like they are smaller projects and thereby hope to get through the review more easily. GF: Maybe it shouldn’t be considered a project because those the three towers will need a separate SEQRA review in order to go forward. NNY: We’ll see about that. I suspect that Forest City Ratner, the city and ESDC (the Empire State Development Corporation) will be arguing that the need for a SEQRA review of the three towers is obviated, eliminated or that the review that now needs to be done for the three towers is somehow diminished by the SEQRA review that was done for the 16 towers plus arena. In other words, watch them try to piggyback on the rest of the project and possibly on the MOU provisions to avoid a SEQRA review of the project in terms of it being the larger 19 new towers plus arena version it would then be. Watch them try to get away with a “negative declaration,” i.e. get a pass to avoid any further review. GF: How can there be segmentation, when there is no plan? Just development rights? NNY: Even if it is covered by what is nominally a separate MOU, that MOU is linked, by date and concept. They are linked as a single plan. GF: What makes it the same plan? NNY: Planned by the same developer? NNY: Planned at the same time and in conjunction with the rest of the plans? NNY: We’ll get back to that.- - We are talking contiguous acres, right? The 22 acres where the 16 towers are located are part of one continuous 30-acre swath of adjoining real estate parcels, right? NNY: It is all proposed for common ownership, right? One giant 30-acre mega-monopoly? NNY: Then let’s look at the linkages in terms of dates. 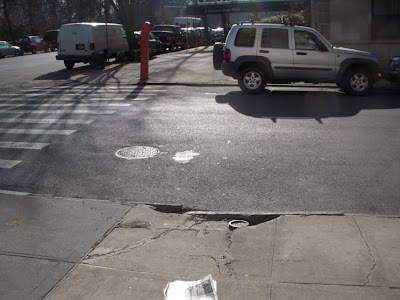 The secret MOU that was discovered by Develop Don’t Destroy Brooklyn was dated February 18, 2005 that was the same date as the public MOU that the public was told related to what was identified as Atlantic Yards. That secret MOU superseded an earlier MOU people didn’t know about dated May 17, 2004. 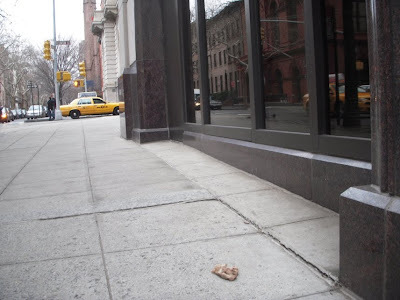 That was just days before May 25, 2004, when FCR's paid consultant Andrew Zimbalist, a sports economist, issued his first report (of two) supporting the project for Ratner, "Estimated Fiscal Impact of the Atlantic Yards Project on the New York City and New York State Treasuries." And that MOU, in turn superseded at least one more MOU dated January 20, 2004. January 20, 2004 was just two days before the New York Times announced that Ratner and a group of partners had gotten the OK to purchase the New Jersey Nets. That’s just what we know from our surface knowledge about dates and events that became public. We don’t know about the additional linkages that may exist behind the scenes. GF: They have air rights to build 1.25 million square feet, but they haven’t said it is either part of the project or a project itself. There is no plan, no scope of analysis, no formal “General Project Plan” before ESDC, no ULURP application, no model of what is actually going to be built, no architect, no nothing to do it. NNY: No nothing! Sounds like they wanted to get away with something. You also seem to be questioning the analysis offered that the secret MOU is partly for the purpose of sidestepping ULURP on the three towers. The secret MOU doesn’t seem to allow the possible use of eminent domain for the three towers at the Atlantic Center site, as it formally does for Site 5 (which is part of the 22 acres). But ULURP might not now be required for the three towers site. 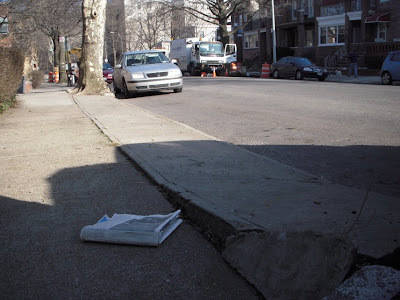 Forest City Ratner would certainly like it that way and that seemed to be the Brooklyn Paper’s analysis. No one has contradicted that analysis. As for using eminent domain there- ESDC would give FCR the right to use eminent domain with a snap of the fingers. Obviously the reason they would do that is so that businesses in Atlantic Center could be eliminated as a problem by having their leases quashed. Like at the rest of the site. • There is no current architect except for the sports arena. • There are no current designs or models of what is going to be built except for the arena- and the word is the arena may be redesigned again too. 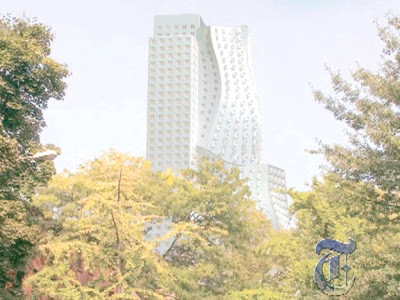 The old designs for all the other buildings don’t apply since Gehry, the original architect, is off the job. • There is no budget. • Subsidies haven’t been identified or decided upon. 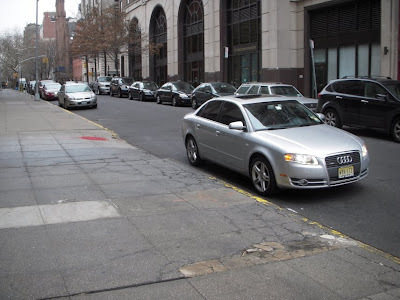 • Ask ESDC or any government agency for any kind of analysis with respect to Atlantic Yards, like a cost benefit analysis or how much profit the developer is making and you generally don't get anything. 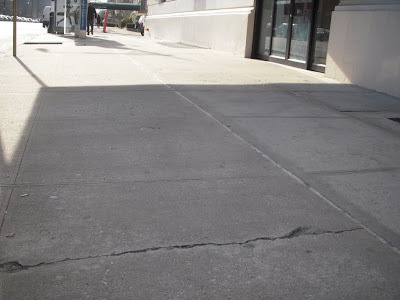 • The GPP specifications really don’t amount to much of anything since whenever Ratner wants to change them he gets to do so, like when he wanted to build a lower-value, lower-capacity rail yard facility for the MTA. When he wanted to be paid more money up front he got that too. And he can opt out: He doesn’t have to build more phases of the project than he feels like. The MTA says he can quit any time. In court, ESDC can only vaguely allude to how there might be documents they can produce that might make the project more definite. • The ESDC board wasn’t even told what the project is, except for the arena and they were told that the arena would be a different arena from the one actually being built. It doesn’t seem that definitions of the project flow from the board or that what the board approval exerts any control. 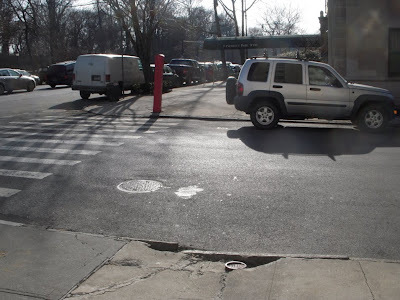 • The schedule is entirely up in the air; that is one thing that is in court right now before Judge Marcy Friedman because it means the Environmental Impact Statement didn’t take into account what the project really is. 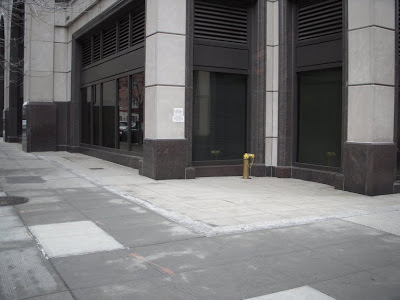 Among other things buildings would be destroyed and the surrounding neighborhoods would be impacted by the blighting effect of that property lying fallow for “decades” or being used as vast parking lots for the arena. • And right, there is no ULURP application for it either. Given all the foregoing, the one common thing that holds is simply that Ratner gets his mega-monopoly on all the property and he gets his override on normal density. That common element applies to the whole shebang, including the three towers. GF: But maybe this is irrelevant right now. The chances they are going to build these three towers anytime soon are pretty slim. There is a good chance it will be quite far in the future. It might not even be in our lifetime. NNY: I don’t know how long you plan to live. I’m planning to hold on. With good medical technology I could live well past one hundred. But yes, all of Atlantic Yards could take a very long time. When ESDC head Marisa Lago said the 16 towers plus arena could take “decades” she compared Atlantic Yards to Times Square and Roosevelt Island. Roosevelt Island, still not finished, has taken more than 40 years. So just like the rest of it, these towers could now be as much as 40 years in the future. 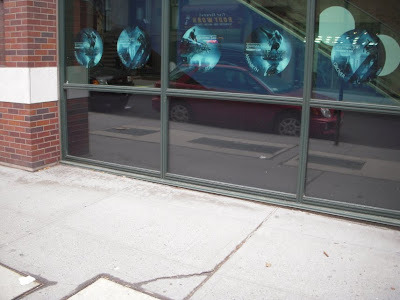 I think that’s one of the things you have to look at in the way that eminent domain was used at this Ratner site. Rather than have Ratner own just Atlantic Center which would have put economic pressure on him to build on it in the near term because it was the part of the more limited parcel he once owned, that impetus for a more immediate improved and redeveloped Atlantic Center has been taken away by giving him the mega-monopoly on so much more property that he won’t be building on for a long time. It really has to be looked at as an interrelated whole. Overall, development in this area is likely being stalled by these recent actions. And also, it is inequitable to use eminent domain to give a developer a no-bid mega-monopoly on more property when the developer already has adjacent property he isn’t building on so far. When you consider it, eminent domain is being used for the 22 acres so that even though FCR has the right to build the three towers (and isn't presently building them) FCR is being given the exclusive right to build on an adjoining 22 acres and then come back and build the three towers later, having knocked of competing neighboring sites first. GF: I don’t know. I’m going to have to think about whether we agree or not. I’ve gotten quite used to thinking about the megadevelopment as consisting of just the new arena plus 16 new towers, not 19. It’s going to take an effort to switch my mind set over to thinking that the megadevelopment is even larger. That 30-acre mega-development is only part of the larger (approximately 50-acre mega-monopoly) that is to be owned by Forest City Ratner mostly through eminent domain and governmental favoritism. 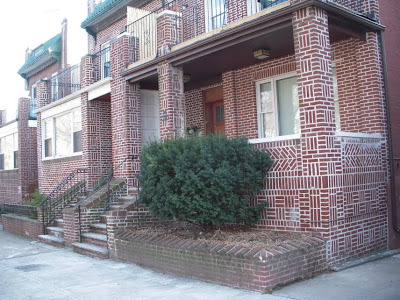 Those 50 acres constitute a heavy preponderance of the prime densely zoned land in or near Downtown Brooklyn sitting astride the key subway lines that make Brooklyn’s best land accessible. The other day we included Senator Charles E. Schumer’s name in a list of “blockhead” politicians supporting the Atlantic Yards megadevelopment, who are apparently of a mind that if you can find cracks in a sidewalk the whole block can be seized from the people who live there, handed to a politically-connected developer and torn down for “redevelopment.” (See: Friday, January 15, 2010, Up and Down, "Blight" Is Everywhere: Just Glance Down “At Any Point” and Find “Blight” Smiling Back to You.) In the case of Atlantic Yards that has been turned into a scheme to give Forest City Ratner (without bid) a mega-monopoly on a vast swath of Brooklyn real estate. The justification for this in the case of Atlantic Yards is the vague anticipation that after tearing everything down Ratner might put something back in few decades. 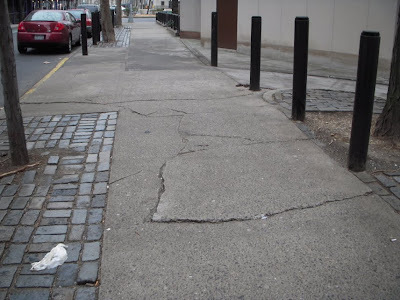 Our previous sidewalk crack article hopped on the bandwagon of a collection of press stories about how ubiquitous “blight”-qualifying cracks in the sidewalk can be, how they can be found surrounding Brooklyn’s Borough Hall, anywhere in Manhattan that you might glance down, and in prestigious Brooklyn Heights, running the entire route from the premier homes on the Promenade to Borough Hall, no matter the street you pick to travel, Montague Street, Remsen Street, or whatever. 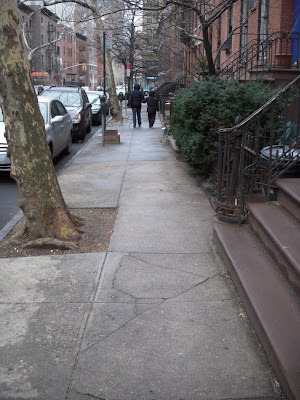 Visit the sidewalks of Senator Chuck’s Park Slope home we did and, lo and behold, it is pretty seriously blighted. 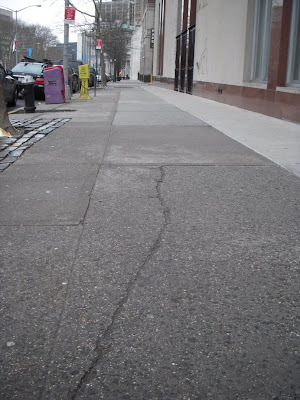 There were sidewalk cracks all over the place. 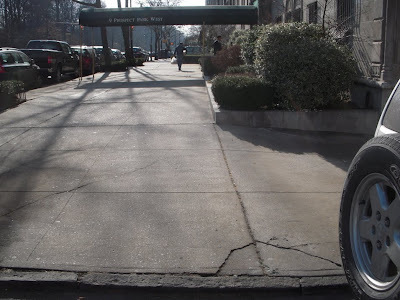 In fact, the problem was not confined to the sidewalks outside the senator’s apartment building: Right across the street there were still more cracks. 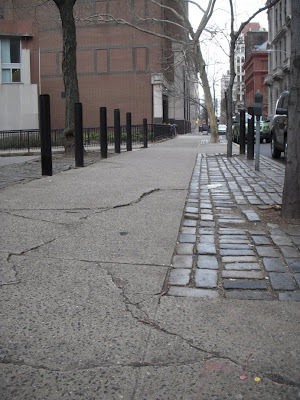 It seems then that, like Atlantic Yards, tearing down just the senator’s block alone would not suffice: This was a case calling for superblocking! 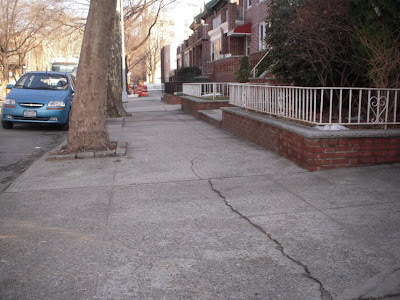 Tear down both blocks together and that way the sidewalks and streets between them could be gifted as extra real estate to the developer allowing it to build more buildings with extra density. 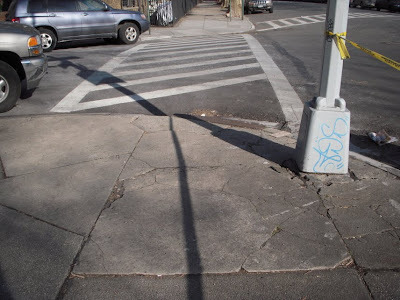 After all, isn’t getting rid of all those sidewalks that are so peskily prone to cracks the best way of dispensing with the epidemic crack problem entirely? 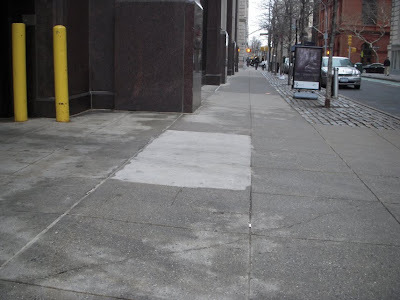 Just to make sure we weren’t being unfair we decided that maybe Senator Schumer’s block could deserve a reprieve from destruction if we didn’t find too many more sidewalk cracks when circling the entire block. No such luck. Senator Schumer’s block is doomed, a real goner if ever we saw one. 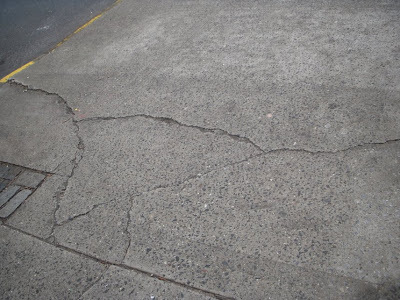 All the sidewalks on all four sides had zillions of cracks, too many to show them all. Would Senator Schumer agree with us that by fair-is-fair standards his block now needs to be taken away from him and the rest of its owners and torn down, just like the property seized for Atlantic Yards? We suspect he might protest. 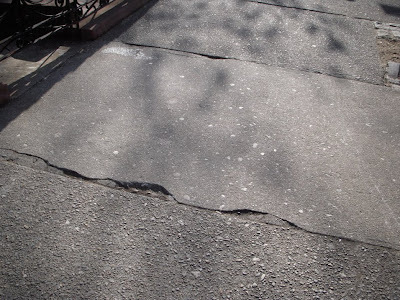 He might suggest that the cracked sidewalks of Park Slope actually have a certain charm. Maybe they do, but if he did protest it would not be the first inconsistency he has shown when supporting the Atlantic Yards mega-monopoly. 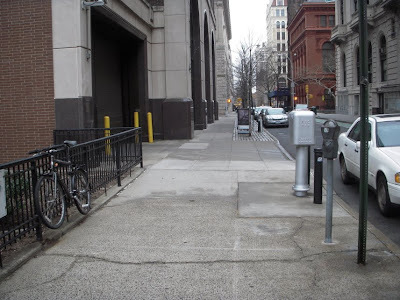 As we said, our last post mentioned the report of similar blight at Marty Markowitz’s new home and since it is a quick trip from Senator Schumer’s by bike we thought we would go see for ourselves. 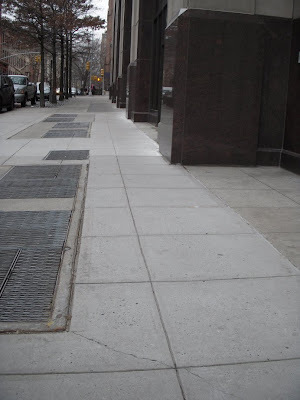 Yes, indeed, there are lots more sidewalk cracks to ogle outside of Marty’s new home. The day we were there (the 16th) there was considerable disruption involving gas line work directly outside of Marty’s home but we were able to take in the scene nevertheless. 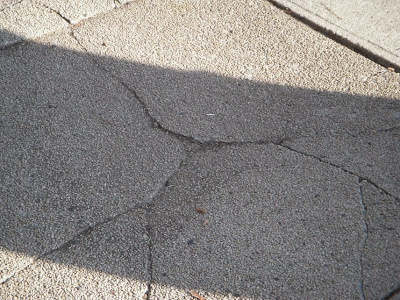 Here then to conclude our pictorial review are photos of the sidewalk cracks to be found in close proximity to Marty’s new house. Sorry, Marty. Your home’s a goner too.